Ken Stark doesn't only write horror, but he mostly does. Why? Because when it comes to shining a light on the best and worst of mankind's nature, nothing works better than a dark backdrop. And if it happens to give a few people nightmares along the way, he'll take that as a bonus. 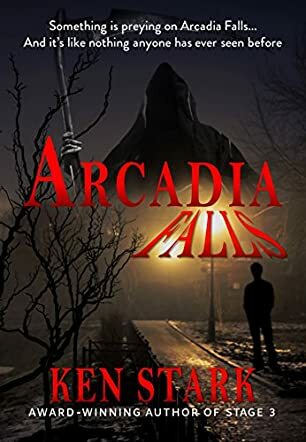 Arcadia Falls came about when he asked a younger reader what kind of book she'd like read next and she responded, "Something scary, with a monster, and some kind of mystery." In deference to younger readers (or, more specifically, to the parents of younger readers) he kept the language clean, but he doesn't believe in an age limit when it comes to dolling out the nightmares. Something isn't quite right in Arcadia Falls, and it's up to a group of teenagers to solve the mystery. Some nerds, later joined by some unlikely additions, find out that something is influencing people's memories: the whole town seems to have forgotten about people who went missing in the past. When the little brother of one of the group disappears, things become personal. A teacher seems to know more than he wants to admit at first, but once he decides to cooperate with the group of friends, he also finds out more than he bargained for. Something is hiding in the middle of the old town - a part of Arcadia Falls nobody seems to visit, and nobody seems to care about. The deeper the friends get into the old part of town, the more danger surrounds them. Will they eventually also be forgotten? Or will they discover the truth? Horror novels these days are often a disappointment. They lack plot and substance. They have flat characters and silly endings that just make you shake your head - if you even have the will to make it to the end of the novel. Fortunately, Arcadia Falls by Ken Stark is neither disappointing, nor lacking, nor boring. And it has an ending you can be fairly happy with, i.e. it's not weird and doesn't make you think "What the heck did I read that for?" The story develops slowly, which gives you a chance to actually get to know the characters and their surroundings. That's good because it makes you care about what happens. If you don't care, then there's no excitement. But you don't want these people to die or suffer even though it's a horror story, so you can imagine it doesn't come without suffering and death. I had a lot of fun reading this novel and cheering the unusual group of heroes and heroines on during their rather perilous quest to rid their home town of an old curse/haunting - whatever you might call an infestation of horrible creatures that feast on people and then erase other people's memories. I was actually waiting for one of the usual horror novel pitfalls that make you want to throw the book against the wall and wonder why the author was allowed to publish the novel, but none came so I was pleasantly surprised. It's a solid horror novel that's suitable for teenagers and adults alike as there is not that much gore, no excessive swearing and no sexual encounters (yes, good books can shine without all of that).